Niagara designs and manufactures Wet Surface Air Cooler (WSAC) closed-loop, evaporative coolers and condensers as a cost-effective technology for both heat transfer and water conservation. 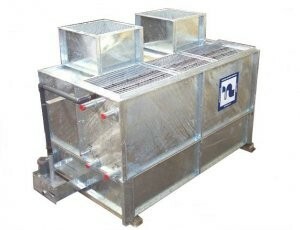 Used in a wide variety of industries, applications for these WSAC coolers and condensers include fluid loop cooling, direct vapour condensing, hydrocarbon desuperheating and subcooling. The use of WSAC systems may reduce the amount of water required in a plant due to the ability to use low quality water as spray makeup. The basic principle of WSAC technology is that heat is rejected by means of latent (evaporative) heat transfer. Warm process fluids or vapours are cooled in a closed-loop tube bundle. Open-loop water is sprayed and air is induced over the tube bundle resulting in the cooling effect. The process fluid being cooled never comes in contact with the environment.